Phuket has long been a favourite holiday destination for Australian families, thanks to its glorious beaches, incredible cuisine and lovely locals. But there’s so much more to this dreamy destination that meets the eye. 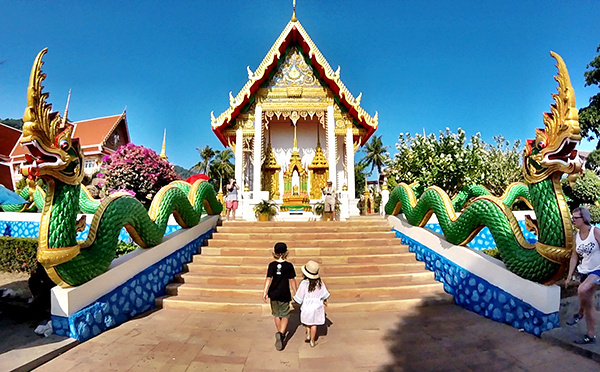 Here, we share 5 reasons Phuket is paradise for kids. Phuket is steeped in history and tradition dating back to ancient times, and exploring Thai culture is an essential part of any visit to Phuket. 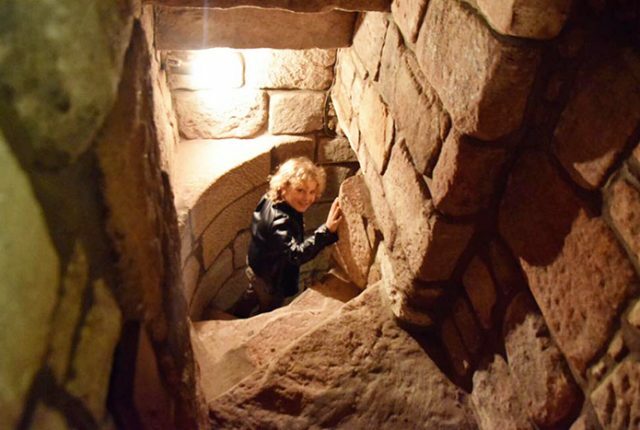 With influences coming from the many traders, explorers and miners who have, at one time or other, called it home, the best place to start is at one of the island’s quality museums. Raffles and Sugarpuff especially enjoyed Thalang National Museum, though they also liked the not quite so edifying but suitably bizarre Phuket Trickeye Museum. 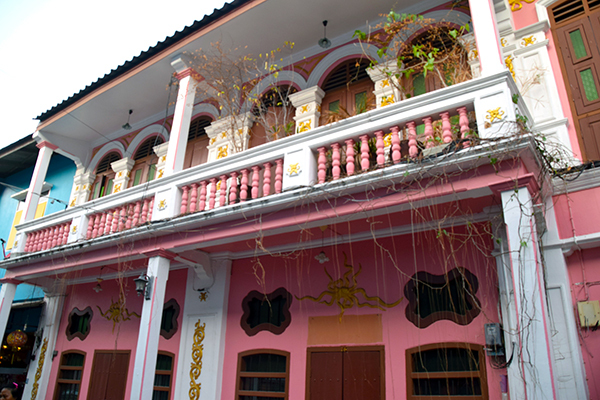 In Phuket Old Town, the historical centre of Phuket, you’ll find colourful mansions and ‘shop-houses’ built in colonial style. While these are gorgeous to see, I have to admit that even more appealing to Raffles were its oodles of restaurants, cafes, and the not to be missed Sunday Walking Street Market. A visit to Phra Puttamingmongkol Akenakkiri, The Big Buddha, is another must. At 45-metres tall, he certainly lives up to his name, and you can spot him from all over the island. Covered with Burmese white jade marble tiles that glisten in the sun, he is a beautiful symbol of hope, and the views from his home on the hill are worth the visit alone. 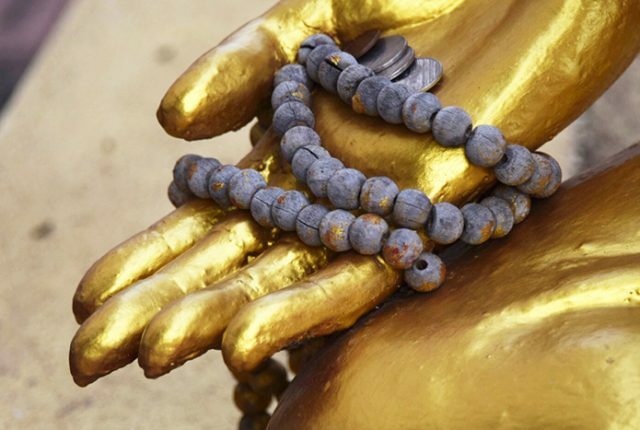 For more of an insight into Thai Buddhism it is also worth exploring some of Phuket’s 29 Buddhist temples. Wat Chalong is one of the biggest and most important as its Grand Pagoda shelters a splinter of bone from Buddha. 220-year old Wat Buraparam in Surin was another winner with the kids, more due to its wedding cake prettiness than anything else. To my kids the intriguing Wat Suwan Khuha doubled as the Bat Cave! Though admittedly these bats were not of the super hero variety. The temple houses a stunning 15-metre reclining Buddha within its limestone cave walls as well as beautiful rock formations and more than a few of the aforementioned winged beasties. But our collective favourite is the colourful Wat Suwan Khiri Khet, just off the main road in Karon. Home to the Karon Temple Market, here we munched on market finds like quail eggs, and unexplained things on sticks, before following the never-ending naga (serpents) that wend their verdant way around the colourful confection of a temple, stopping only to say hello to the kindly orange-robed monks, random chickens, and stray dogs that call the temple home. We’re lucky enough to have visited Phuket on April 13th, the start of Thailand’s New Year festival, Songkran. It is the country’s most important and soggiest public holiday, but what has become a take-no-prisoners nation wide water fight actually comes from gentle and spiritual Buddhist beginnings. 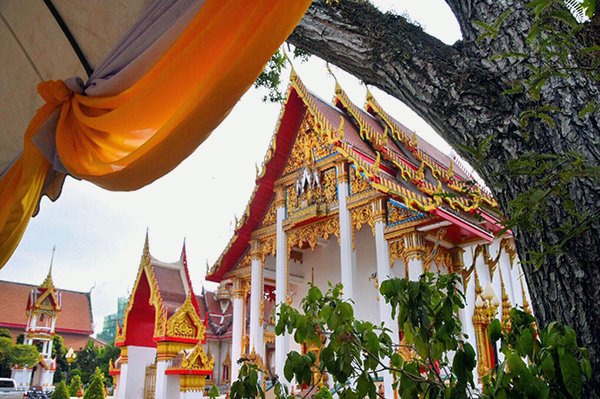 We found Wat Chalong, Phuket’s biggest and most revered temple, the best place to explore these beautiful traditions. 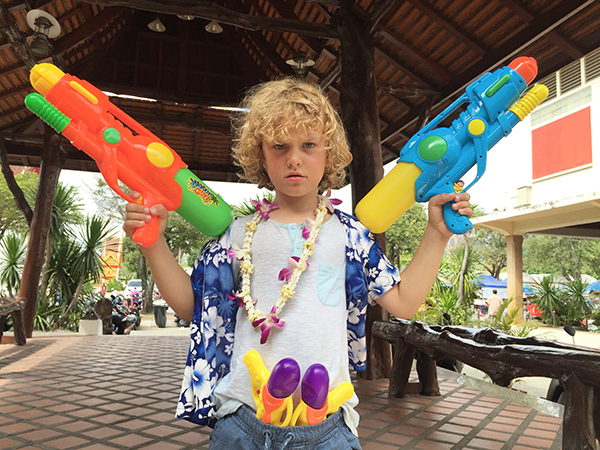 Though my excited wee water warriors were a little more interested in filling their arsenal of garishly coloured water pistols and hitting the streets to join in the wet and wild fun. 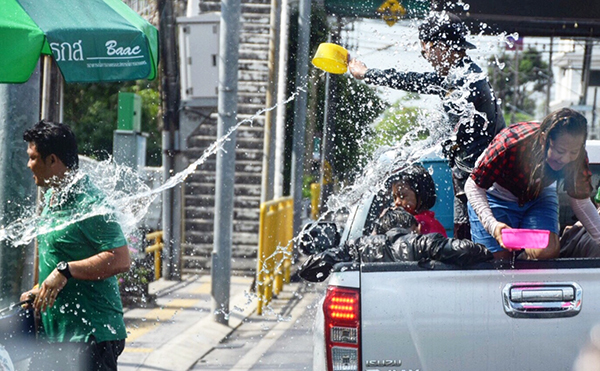 While Songkran may be Thailand’s most famous festival, it is not its only one. 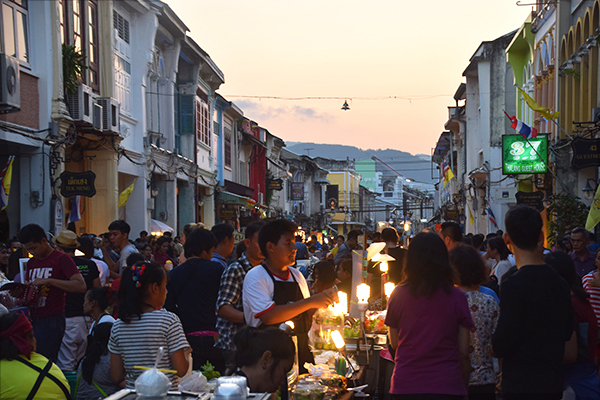 The people of Phuket know how to throw a party and there are frequent weird and wonderful celebrations offering a unique glimpse into the island’s history. 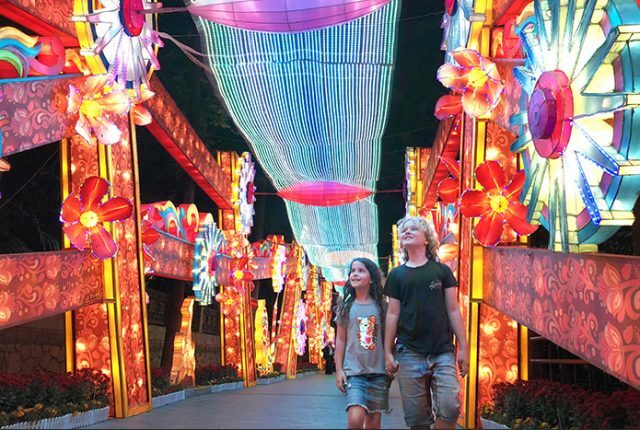 Two of the biggest and best are the Loy Krathong Lantern Festival and Phuket Vegetarian Festival. Loy Krathong is Thailand’s pretty Festival of Lights and best known for its lanterns and pretty candlelit paper boats. 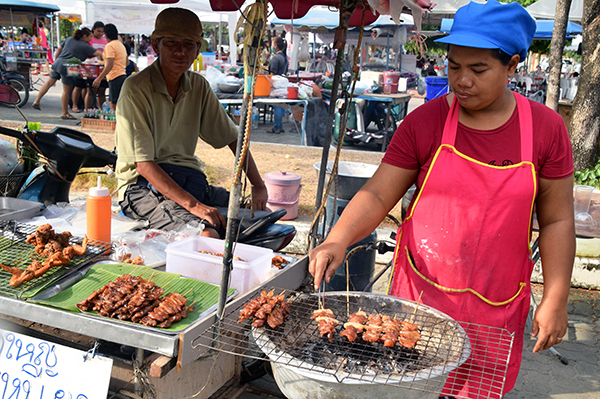 The Phuket Vegetarian Festival is less delicate, and along with a nine-day abstinence from meat, it is accompanied by a whole bunch of eye-watering “don’t try this at home” rituals involving acts of extreme pain that would put the Jackass boys to shame. Of course you don’t have to visit during Songkran to get wet in Phuket! Few destinations offer the abundance of picturesque, easily accessed beaches that this island does. But they’re not all created equal. In our opinion the party pace and surreal sights of popular Patong Beach aren’t ideal for younger kids. Instead we prefer nearby Karon Beach and Kata Beach, which are stunningly beautiful, still offer plenty of that endearing Phuket buzz, plus offer excellent water sports options like sea kayaking, SUPing and kite surfing, minus the seedy adult party vibe. 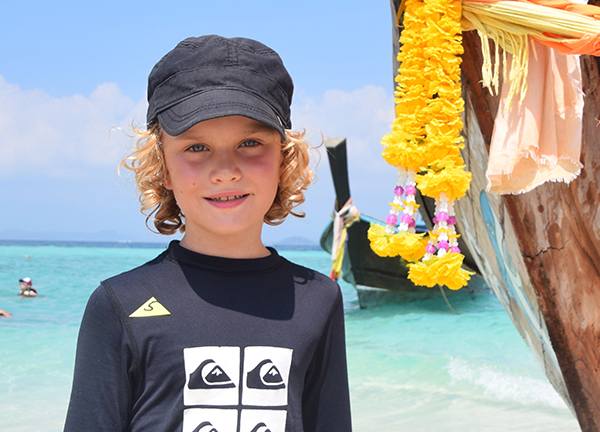 Our kids also loved Surin Beach, on Phuket’s west coast. Its turquoise water and white sand do make it quite popular with tourists but it’s not as busy as many others. From tiny rocks bursting out of the water to larger, palm tree covered islands, Phuket’s surrounding islands are stunningly beautiful and a day trip for a spot of snorkelling and swimming is a must for families. Koh Phi Phi Island is Phuket’s resident island rockstar, famous for its blue water beauty. But if the two-hour boat ride with the kids is enough to put you off, there are closer options. Just off Phuket are two pretty islands called Khai Nok and Khai Nui. While very busy, Khai Nok boasts white-sand beaches surrounded by clear, turquoise water. And you can kick back under an umbrella or snorkel with the kids in and around a fish-filled aquatic wonderland just a few steps off the sandy shore. Regardless of which beach you choose, don’t let your kids swim without supervision, and be aware of seasonal box jellyfish invasions and Phuket’s notoriously heavy rips. 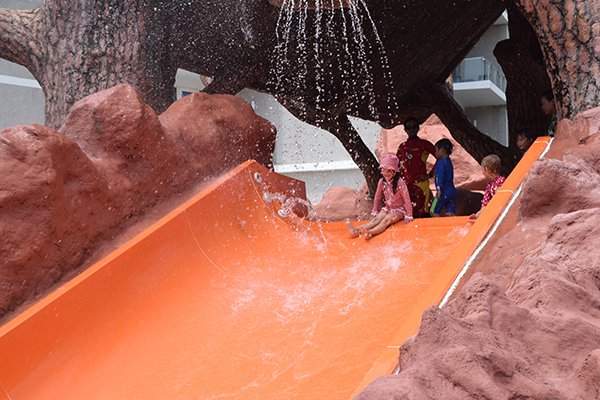 If you don’t want to worry about stings or rips at all then head to Splash Jungle Water Park. There are loads of wild water slides as well as a wave pool and an aqua-play kidzone with tipping buckets, hoses, slides and nets. While Raffles was all about the heart-stopping high slide and spinning funnel, Sugarpuff preferred to take her chances idling along the lazy river with her very lazy mama. For families, part of Phuket’s charm has always been the huge selection of kid-friendly accommodation, from budget to five-star. But for a family holiday with a luxurious twist we suggest you stop trying to cram the entire clan into one tiny room or looking for a space to lay your towel beside a noisy, busy pool and instead opt for a private villa. An ideal choice for larger families, with many sleeping eight or more people for a per villa rate, Villa accommodation gives you the chance to live like a rock-star without breaking the bank. But the real beauty of a villa is that it not only gives the whole clan space to roam and sleep, but also offers families uninterrupted, intimate opportunities for bonding and fantastic facilities that make your holiday digs feel just like home (just a way fancier and more glamorous one). These stunning, family-friendly villas in pretty Surin Beach have options for everything from stunning private pools, unbeatable ocean views, beachside locations, on-call chauffeurs, fully equipped kitchens and dining rooms for family meals (which is handy if you’re travelling with fussy eaters), and the option of staff to assist with cooking. Yes, please! Seriously, this is us here. As if we’re going forget to mention that! One of the world’s most flavourful cuisines, Thai food is extraordinary. 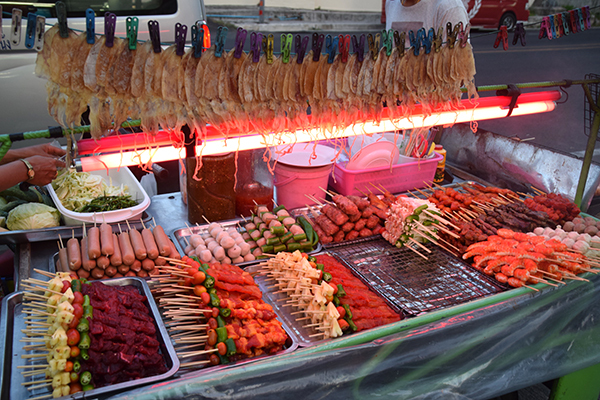 But Phuket has its own unique culinary heritage with Malaysian and Chinese migrant influences, amazing fresh produce and an abundance of fresh seafood that takes the usual Thai flavours to a whole other level. Curries are richer and creamier, fresh seafood is a staple, noodles come in a variety of textures and thicknesses and spice pastes often boast aromatic Muslim influences. You’ll also find an abundance of Dim Sum along with a variety of, often inexplicable, delights at the island’s many food markets. 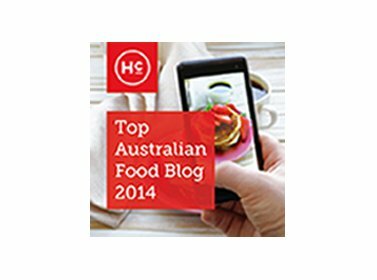 For tips on exactly what foods to try click here. If your kids aren’t adventurous eaters there are restaurants to suit every taste, and a decent selection of both Asian and western food, so a burger fix or a simple bowl of pasta is never far away. 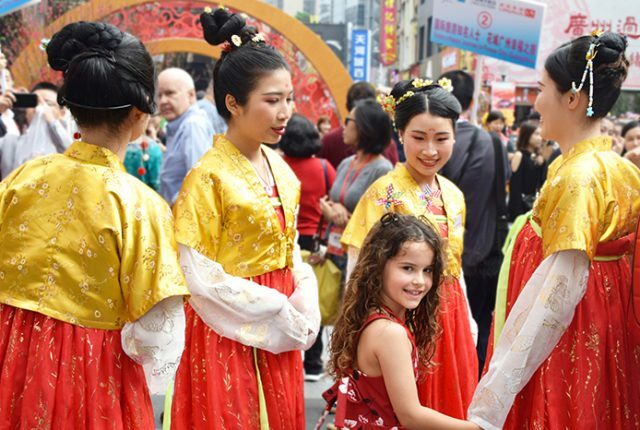 But we’d save them as a last resort and advise using your best negotiating skills to tempt the kids to at least try some of the simpler chicken, noodle and rice dishes. Just remember when ordering for younger palates that “mai pet” means not spicy, unless of course you’re travelling with a fearless foodie like Raffles who’ll instead ask them to amp the heat up a notch! 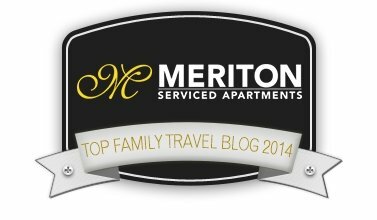 Disclosure: This post was written in collaboration with Villa-Phuket.com – But all experiences were independently sourced and paid for and opinions are our own. I like that you kicked this off with a mention of museums because I always feel like a bit of a dork for being interested in that kind of thing! Sigh. That private villa sounds so good right about now. With a side order of every piece of food in that photo. family policy is to keep educational as well as fun! 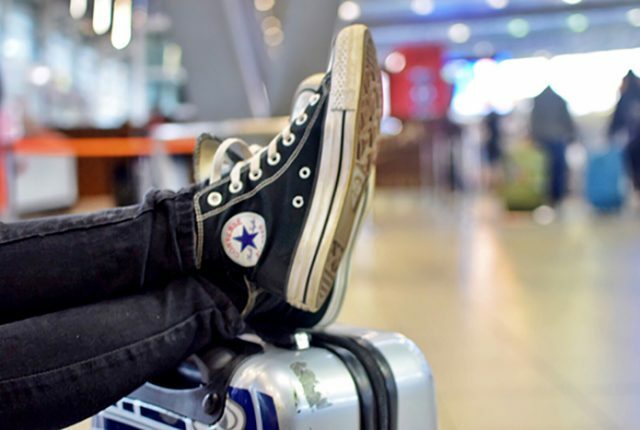 You’ve won me over – off to talk to the family now about our next adventure! We hope to get here in the next few years- gorgeous! I’ve been to Thailand but never to Phuket. It looks fabulous! A villa with cooking staff sounds like the ultimate in luxury to me. Not having to cook is my idea of heaven! 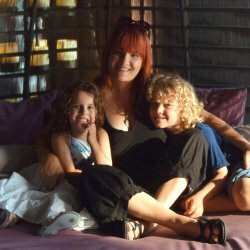 We spent six months living in Bangkok with our then two-year-old daughter and all three of us loved it! My husband and I have previously visited Phuket but this definitely makes me want to revisit with our daughter. Not only for kids, Phuket is a piece od paradise for adults too! Great post Aleney!